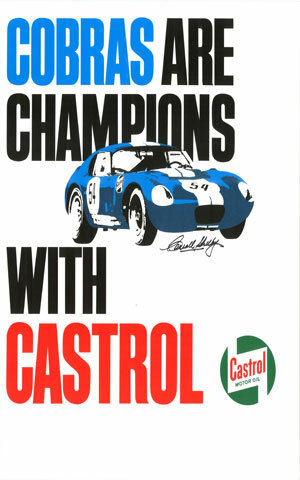 Cobras are Champions with Castrol Ad with Cobra Daytona Coupe. From The Carroll Shelby Archives Is This Licensed Photo Print On a Metal Sign. The Size Is 11" x 17". It Is Made Of 24 Gauge Metal With Holes On The Corner For Easy Mounting. The Metal Is Powder Coated and The Image Is Embedded With Vibrant Color.